… RENOVATES 21 CLASSROOMS IN APAPA, LAGOS. One of the leading oil major ,11plc ,formerly Mobil Oil Nigeria Plc , has raised the bar in social investment with the renovation of two building structures consisting of twenty one classrooms at Baptist Primary School ,Marine Beach ,Apapa Local Government Area ,Lagos State as part of its corporate social responsibility initiatives in its host community. The multi million Naira infrastructure upgrade which was embarked upon as part of the company’s cardinal programme of giving back to the communities where it operates has been handed over to the state government through the State Universal Basic Education Board [SUBEB] . Baptist Primary School is within Apapa LGA and was in a very deplorable state with 80- 90% of the building roofing sheets blown up leaving the upper floor of the three storey structure out of use and the walls in dire need of repainting . The pupils of the school and teachers alike were also having a hard time coping with the rigors of using the facility thus inhibiting conducive learning opportunities in the school. The Managing Director of 11Plc, Mr Adetunji Oyebanji said the company took the opportunity to rehabilitate the school on four different fronts namely: giving back to the host community; creating a conducive learning environment for the pupils and other stakeholders; responding positively to the request of the community heads and government agencies; and avenue to the company’s positive contributions to its customers and community to reinforce its brand equity and corporate image. He pointed out that the school is not only [popular within the company’s immediate community as it is one of the biggest in the LG and operated since the 1960s stressing that the gesture will go a long way in deepening and reinforcing the harmonious relationship between 11PLC and her host community as well as government agencies . ‘’We are always happy and delighted to give back to our community and the environment as a whole .Without the peace ,cooperation and support of the host communities I am certain businesses cannot thrive .So as they say charity begins at home “ the MD noted . According to Oyebanji, the project is our humble gesture even as we hope the community appreciates to further serve as encouragement for 11PLC to do more. “We feel glad and satisfied as we know this is a citadel of learning and you cannot imagine what level of good children who come out of this school; will do for the greater good of the society as a whole “Mr Oyebanji pointed out. In an e-mail statement sent, he emphasized that assisting government to provide good infrastructure to aid quality education delivery is a cardinal aspect of its social investment initiative adding that this also partly explains the fast delivery of the project . The 11PLC Chief Executive recalled that the company has been in the forefront of contributing meaningfully to the nation’s development through thought out strides as part of social investment after purposeful interactions with benefiting communities on how best the company could impact on their lives. 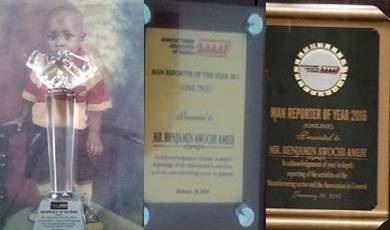 Mr Oyebanji recalled with deep sense of fulfillment some notable CSR activities undertaken by the company amongst which was the extensive construction and rehabilitation work on the then Malu Road ,now Mobil Road en-route to Boundary market , a project that was handled by Julius Berger . In acknowledging 11PLC on the project ,the State Universal Basic Education Board said “ the Board appreciates this noble gesture as it complements the efforts of the state government at improving basic Education through the provision of conducive environment for effective teaching and learning activities “ . The Board through its secretary Mrs Adelaja Abosede on behalf Executive Chairman expressed deep thanks for the project embarked by the company which had already been put in use at the commencement of the 2nd term of the 2018/ 2019 school session in the state. “The gesture will come a long way in the history of the school and your company will be growing from strength to strength and progress to progress “she declared in an emotion laden appreciation letter to 11Plc. She described the company as a socially responsible organization that cares for the wellbeing of its host communities a lot adding that the facelift given to the school has affected positively the affective and psychomotor domain of the pupils.